Putting all speculations to rest, Chief Minister Naveen Patnaik on Sunday asserted that Biju Janata Dal (BJD) will have no alliance - direct or indirect - with any political party in 2019 elections. BHUBANESWAR: Putting all speculations to rest, Chief Minister Naveen Patnaik on Sunday asserted that Biju Janata Dal (BJD) will have no alliance - direct or indirect - with any political party in 2019 elections. 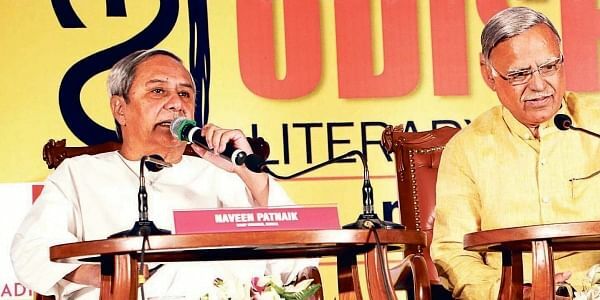 The regional outfit, he said, will defeat the BJP on its own.“We will have no alliance and defeat them (the BJP) on our own,” the Chief Minister said in a tete-te-tete with Prabhu Chawla, Editorial Director of The New Indian Express at the concluding session of the Odisha Literary Festival 2017. To emphasise BJD’s stand of maintaining equidistance from the Congress and BJP, Naveen said the regional outfit will have no alliance either direct or indirect with any political party. When his attention was drawn to BJP’s 120+ mission in Odisha for the 2019 polls, Naveen said development work of the State Government will give the BJD adequate number to form next government. “We will get a comfortable majority,” he said, but refused to guess the number of seats his party will win. Replying to a question on what will be slogan of the BJD for 2019 polls, the Chief Minister said, “It remains the same. We will continue to work hard for people of Odisha.”The Chief Minister strongly disapproved the derogatory remarks allegedly made by a senior minister against a BJP woman leader. Stating that such behaviour is totally uncalled for, Naveen admitted that he had a talk with the Minister over the matter. “Even I don’t take anyone’s name in my speeches,” he said. Asked about the reasons behind the BJD’s four consecutive wins, Naveen attributed the success to the anti-poverty programmes, pro-farmer policy in the last 10 years which has doubled their income, a strong food security net with different welfare programmes including 25 kg rice per month at `1 per kg, construction of one million pucca houses for the poor and many other welfare schemes taken up during the last 17 years. He also said it was his administration’s efficiency which could see successful hosting of the Asian Athletics Championships 2017 in a short notice of 90 days when other States declined. One million people were rescued in a matter of hours when cyclone Phylin struck Odisha in 2013, he said and added the United Nations also praised the cyclone measures put in by the State Government.